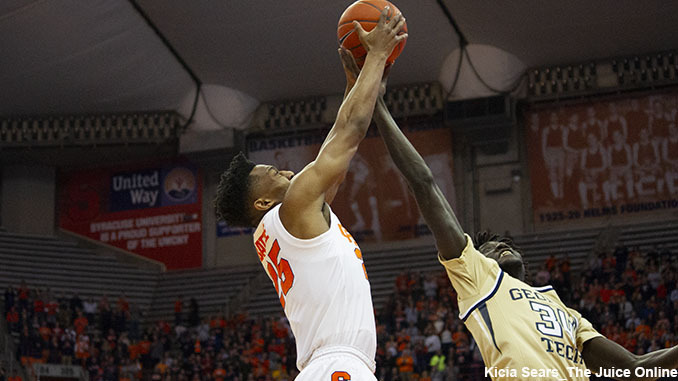 Jan 12, 2019; Syracuse, NY, USA; Syracuse Orange guard Tyus Battle (25) goes up for a rebound against the Georgia Tech Yellow Jackets forward Abdoulaye Gueye (34) during the second half of the Yellow Jackets' 73-59 win over Syracuse at the Carrier Dome. Mandatory Photo Credit: Kicia Sears, The Juice Online. Fresh off a big win at No. 1 Duke, Syracuse returns to the Carrier Dome on Saturday at 1 p.m. to play Pitt. Ahead of the game, The Juice Online’s Brad Bierman and Wes Cheng give their predictions below. BRAD BIERMAN (Season Record: 1-1): One thing’s for sure with the ACC so far this season, it doesn’t seem sense to make a prediction as to which sort of performance we may see in any given game by this Syracuse team, but that’s exactly what we have fun doing during the course of the season. Which brings us to Saturday afternoon’s home matchup with Pittsburgh, a team that literally has nowhere to go but up under new coach Jeff Capel, after finishing 0-18 in the ACC last year under the departed Kevin Stallings. At 2-2 in league play, the Panthers look fast and athletic led by a trio of freshman Trey McGowens, Xavier Johnson and Au’Diese Toney who combined for 57 points in their impressive win over Florida State Monday, the same night SU knocked off Duke. For Syracuse, what do you do for an encore after beating No. 1? Continued improvement from Pascal Chukwu makes this a completely different team. Any output he contributes offensively, on the boards, and on the foul line takes the pressure of the ‘Cuse scorers but he has yet to be consistent. We see the young Panthers playing toe-to toe with the Orange until midway through the second half, before SU pulls away led by big games from Hughes and Brissett to beat Pitt 77-69. WES CHENG (Season Record: 3-2): First year Pitt coach Jeff Capel may be ahead of schedule. After the Panthers dismissed Kevin Stallings last year after he failed to win a conference game, Capel already has two ACC wins, including a 75-62 upset over then-No. 11 Florida State on Monday. That combined with a win over Louisville earlier in the month has Pitt at 2-2 in conference play, and 12-5 overall. Capel has made an immediate impact on the program by bringing in freshmen Trey McGowens, Xavier Johnson and Au’Diese Toney. McGowens was the only top 100 recruit of the three, and has averaged 14.4 points, 3.8 rebounds and 2.1 assists so far. He was especially key in Pitt’s two ACC wins, scoring 30 against the Seminoles and 33 against the Cardinals. Meanwhile, Johnson leads the team in scoring at 17.1 ppg and Toney is averaging 10.0 ppg. That all points to Pitt being far more competitive than anyone thought they’d be at this time of year and the future is certainly bright. I don’t expect Pitt to shoot over Syracuse’s 2-3 zone. If it’s anything like Pitt’s upset of FSU, the Panthers will put their heads down and attempt to pound their way to the basket. Given that the Panthers are a young team and haven’t seen a zone quite like SU’s, that will give the Orange an advantage en route to a 65-54 win.